Fine-art is probably not the first thing that comes to mind when one talks about Aviation photography. But there is however a market for gallery prints and other art-work in this space, as a lot of aviation geeks love to hang up a beautiful image of their favourite flying machine. 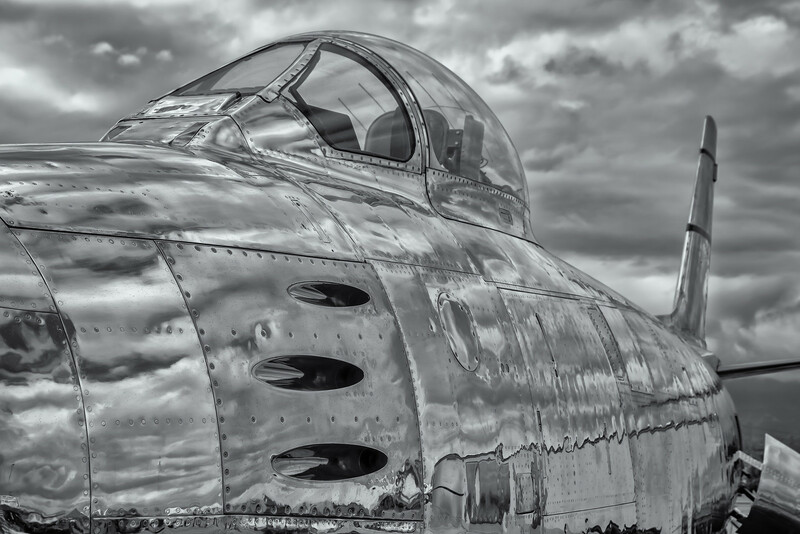 Especially for the aircraft that are left in bare metal, the shiny surface reflecting in the sun often makes for an interesting black and white fine-art image! Such was the case with this 1950's F-86 Sabre jet, which I photographed at the Planes of Fame airshow in Chino (CA, USA) end of last month. This particular one served in the German Airforce after the war and is in the process of being restored back to flying condition by the famous Lewis Air Legends warbird restoration company. More images from the amazing Planes of Fame airshow in Chino, CA can be found here. Remember: "Don't allow the fear of falling, keep you from flying"
Festival city, is a large residential, business and entertainment development along the Dubai Creek, close to Business Bay bridge. The project was started in 2003 and its expansion is now slowly coming to the "complete status". 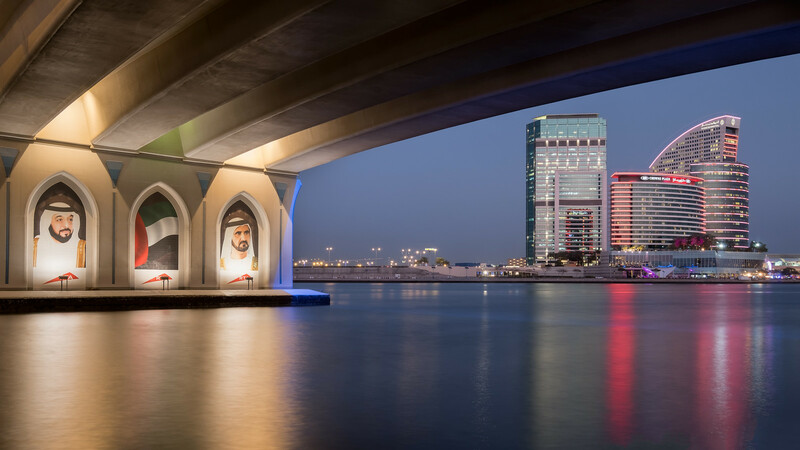 Across the Creek, under the Business Bay bridge, one has a spectacular view on the two Festival city hotels. The image was made during my favourite time, the 15 min lasting "blue hour", just after sunset. This short time window, allows me to have a nice balanced look between the foreground (under the bridge) and the architecture in the background. For years "bridges" have played a big role in my Architectural photography; a quick collection of some of these shots, can be found here. Now that the temperatures are on the rise over the Gulf region, the best time for Landscape photography, is slowly coming to a close... Lets enjoy those last moments of the season! The sunset image below was shot at the Palm dropzone of Skydive Dubai; right in front of Dubai Marina with its spectacular skyscrapers and just adjacent to the manmade island, "Palm Jumeirah". In less than 10 years, Skydive Dubai has become one of the Worlds premier Skydiving centers. It was also one of the main sites of the 2015 World Air Games, held in Dubai last year. The Skydive Dubai runway, which is visible in the top right of the image, sits on pillars mounted in the sea and makes for a spectacular aircraft carrier like airport. Although I initially processed the image using classic image blending techniques, I ended up using a version processed in MacPhun's Aurora HDR Pro for a more dramatic effect. I especially like how one can easily use different versions of the image by using layers and then easily paint in what is needed without the usual hard transitions. And oh boy it is fast! The processing of the image took me less than 5 minutes; while it took about 40 minutes to get a similar result with the image blending technique in Photoshop. Remember, "Every sunset brings the promise of a new dawn". NEW YORK city remains my favourite Global Street Photography place. Having a great street photography camera like the new Fujifilm X-Pro2 with you, makes that even all that more enjoyable! Although I do use the EVF (Electronic Viewfinder) for the large majority of the shots, there is definitively a place for using an OVF (Optical Viewfinder) for those shots where you want to have a wider view outside the frame. 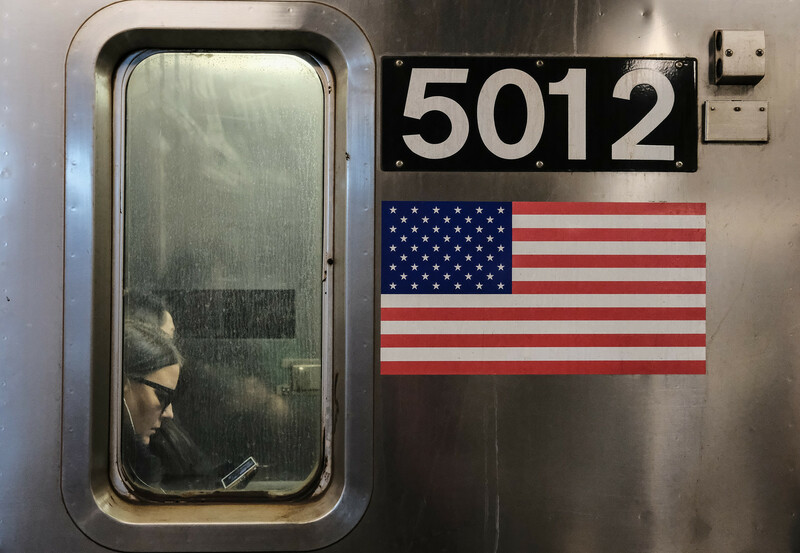 Photographing on a busy subway, where one wants to see the people coming into and exiting the frame, is a great example of that. While classic Street Photography is mostly Black and White, I must say that I do enjoy shooting Color more and more; especially the great Fujifilm "Classic Chrome" film simulation!